Hokm - thanoscardgamess jimdo page! Hokm in Iranian means Trumps. This is an old traditional plain trick-taking card game from Iran. In Iran the game is played by everyone, especially old men, artists, gamblers and gangsters. In the first hand, a player becomes randomly "Hakeem", the trump-selector, and his team becomes the claiming team. 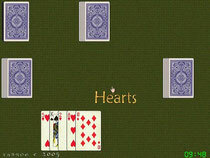 Five cards are initially dealt to each player by a non-claiming team member, in packets of 5. After the initial cards have dealt, Hakeem names trumps for that hand, based on the suits he's holding at that point.